Guess the weight and win a $100 gift certificate! This year for the NFA Convention in San Diego, we had to ship all of our products to display in the exhibit hall. Now it’s your chance to guess how much we shipped! Guess the weight of the products plus the pallets; the closest guess wins! 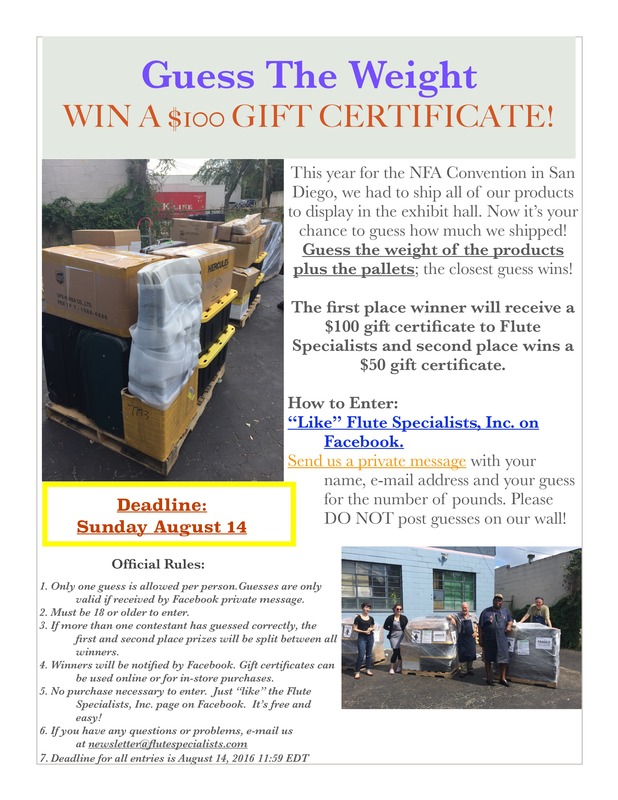 The first place winner will receive a $100 gift certificate to Flute Specialists and second place wins a $50 gift certificate. “Like” Flute Specialists, Inc. on Facebook. Send us a private message with your name, e-mail address and your guess for the number of pounds. Please DO NOT post guesses on our wall! 1.Only one guess is allowed per person. Guesses are only valid if received by Facebook private message. 2.Must be 18 or older to enter. 3.If more than one contestant has guessed correctly, the first and second place prizes will be split between all winners. 4.Winners will be notified by Facebook. Gift certificates can be used online or for in-store purchases. 5.No purchase necessary to enter. Just “like” the Flute Specialists, Inc. page on Facebook. It’s free and easy! I attended my first NFA convention in the summer of 1993 in Boston. I went to the convention and was completely overwhelmed by the sights and sounds. The following summer, attending as a seasoned expert, the convention was held in Kansas City and I decided to volunteer my time as a door guard. I really loved contributing and feeling like a part of the organization. In the year 2000 I was finishing up my master’s degree at Ohio State with Kathy Jones and she suggested that I serve as Equipment Chair for the August convention which was being held in Columbus. I enthusiastically signed on to join the team and launched myself into a career of service. The experience was certainly demanding; the Equipment Chair is responsible for every chair, stand, microphone, projector, marimba and kitchen sink that is requested. After the convention I was exhausted but very proud of the hard work our team had done. I had the privilege of working with George Pope and Jane Berkner who have since become lifelong friends. At that time in NFA history the Equipment Chair was a revolving position and many people have held it including the indefatigable Debby Hyde-Duby. After the Columbus convention in 2000, I still served the NFA at every convention by taking pictures, videotaping masterclasses, and helping in any way I could. In the spring of 2008, Madeline Neumann (former NFA convention manager) contacted me and asked if I would like reprise my role for the upcoming convention in Kansas City. At this convention I worked alongside with Jonathan Keeble, Rebecca Johnson, and Townes Osborn Miller. I think the most appealing part of this work is the problem solving. At this convention a cellist had traveled to Missouri to perform at the convention and after he arrived he realized his cello had been damaged in transit. We worked together to find a suitable instrument from a local music store and the performance went off without a hitch. The 2009 New York convention was unbelievable, we had over 5,000 flutists in attendance and we set a new Guinness Book of World’s Record for the largest flute choir ever assembled (conducted by James Galway). Note: This record has since been broken. My then boyfriend (now husband), Jack, came to New York with me hoping to have a fantastic vacation. I was so overwhelmed with the enormity of the convention Jack, thankfully, helped me the entire week. Soon after this convention Jack was made my official Equipment Chair Assistant! He now accompanies me to every convention and he is a great help – especially in lifting heavy things! Fast forward to the 2012 convention in Las Vegas. Tadeu Coelho was the incoming Program Chair for the next convention and decided to shadow each NFA staff member. After watching me for a few hours he inquired, “You have a doctorate right? Then why are you moving chairs and stands?” After laughing for a while I explained that moving chairs and stands was just part of the job. Dr. Coelho suggested that I start an internship program to get some much needed help with my job. In the spring of 2013 the NFA sent out a call to the contingency for summer interns. The response was overwhelming and I had the difficult task of narrowing down the pool of outstanding candidates. We had an incredible group that included undergraduate and graduate students from around the country. It is my hope that these interns become the future leaders of the National Flute Association. The 2016 convention will celebrate the third anniversary of the internship program. I’m very happy to have created a program that serve the needs of the NFA and of budding professionals for years to come. Dr. Kimberlee Goodman has been on the faculty of Otterbein University in Westerville, Ohio since 2005. She has performed and presented in Thailand, Korea, Sweden, Finland, and Argentina. In 2013 she joined the staff at Jazz Arts Group in Columbus, Ohio where she serves as the Orchestra Manager for the Columbus Jazz Orchestra. She also runs the annual fundraiser for the organization. Dr. Goodman holds flute performance degrees from Arizona State University and The Ohio State University.